Pork Shoulder Slow Roasted | Salsa Verde and a Turnip Truck Gift Card Giveaway! I can barely believe spring is already upon us. It seems as if we never actually had a winter. We had 70 degree weather in February, it “snowed” once or twice, and I barely turned on the heater this year (so my gas bill was low!) In fact, the only thing “wintery” about this winter was that my blog went into a little hibernation! Rest assured, we’re getting back up to full speed! The ole blog is getting a top to bottom remodeling job and I can’t wait to show it to you guys. In the meantime, I’ve also started writing restaurant reviews with Zarna on a new site – 2 Dine for Nashville, which has been an absolute joy. So thanks for bearing with me through the change. As we get into spring and the farmers markets are abundant with fresh produce, epicurean adventures will be all back to normal. In the meantime, I thought I’d pop in and share some knowledge on some cool things. You see, after the CSA season ended in December, I was at a loss for what to do. I no longer had 10 lbs of kale sitting around, or a mound of sweet potatoes, or even a teeny-tiny radish. Transitioning from the bounty of farm fresh ingredients, I found it difficult to make meals. I almost forgot what it was like to go grocery shopping. But, after our CSA experiment, I was determined to find and support a fine local establishment. Luckily for us in Nashville, we have The Turnip Truck, a locally owned grocery store committed to selling the finest natural, organic foods and showcasing local artisans. Ever since the Turnip Truck moved to the Gulch, I always had it in my market rotation, for nothing else than to pick up my Springer Mountain Farms (Georgia) chicken for the week. It’s the best chicken I’ve ever had and at $8 for a whole bird, you can’t go wrong. But lately, I’ve been going there weekly to pick up fresh produce, meat, grains, cheese, and of course, beer. The meat counter is one of the better ones in town and for me, that’s huge. One day I walked in and needed to pick up 3 pounds of chicken thighs for some sausage I was making. I asked the friendly butcher who said he only had whole birds, but was willing to cut 3 lbs of thighs fresh, just for me. That’s customer service, folks! He was quick and efficient and by the time I got done walking around the rest of the store (i.e. eating all the free samples), my chicken thighs were ready to go. Thank you, sir. All of their beef and pork is certified organic and comes from a co-op of farms in Wisconsin. The steaks I got one day (ribeyes) were fantastic and the butcher even cut them to my specifications (2 inches thick, please!) 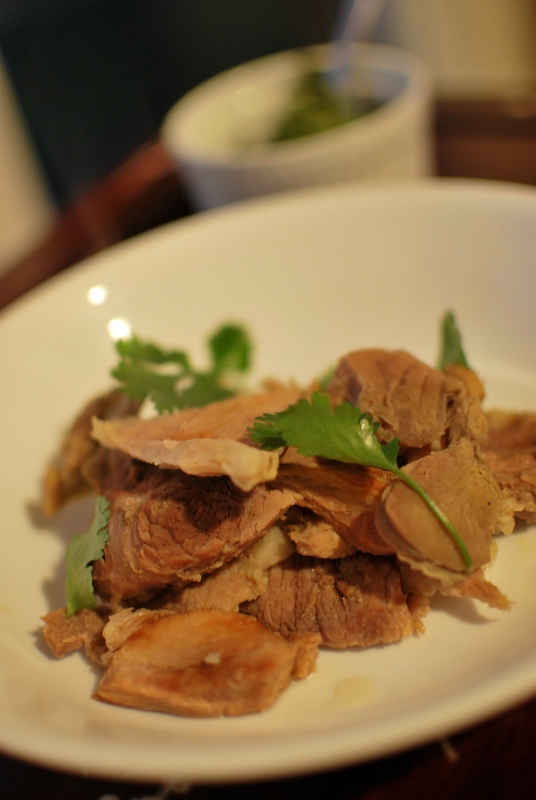 And when I wanted pork shoulder for this dish, they were kind enough to order me some and had it in the next day. Speaking of pork, let’s get to the meat of the matter. Pork shoulder is one of my favorite cuts of meat. And as we are leaving the winter months, I needed just one more slow cooked, braised dish that would warm me up from the inside. A way to say goodbye to winter, but hello to spring. 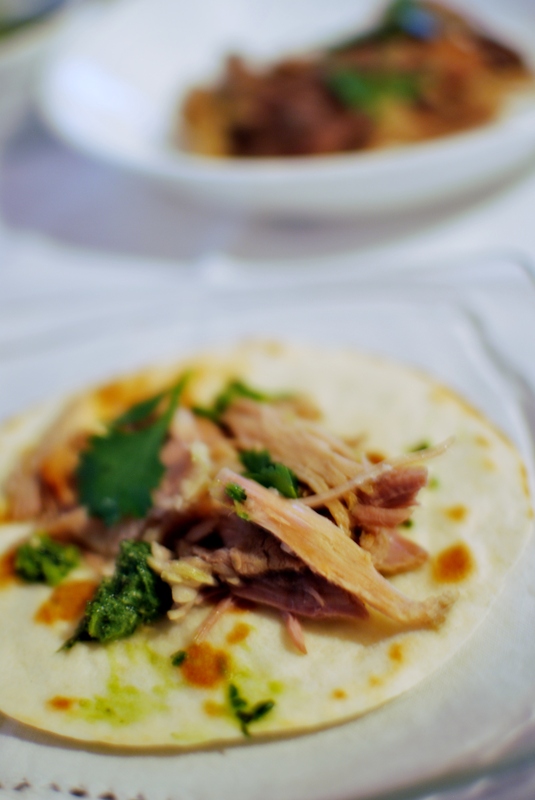 Slow cooked pork, with a salsa verde made out of cilantro, rosemary, capers, lemon juice and olive oil is a match made in heaven. The salsa verde (not to be confused with a tomatillo salsa) cuts right through the richness of the meat and since it’s chock full of herbs, its the perfect condiment during spring. And let me tell you, It’s good on a roast chicken, a steak, or a piece of fish. Make a big batch and eat it all week! Combine the orange zest, lime zest, garlic, rosemary, olive oil and honey. Season with salt and pepper. Rub mixture all over the pork. Put the pork in a roasting pan and pour the citrus juice into the bottom of the pan. Roast the pork for about 4 hours until it is meltingly tender. Remove the meat from the oven and let rest for 30 minutes. Shred the meat with your hands or two forks, or chill overnight and slice with a knife. Serve with salsa verde, some warm tortillas, and pickled onions. Combine the cilantro, basil, rosemary, garlic, capers, jalapenos, and lemon zest in a food processor until thoroughly incorporated, but still chunky. Mix in the lemon juice and extra virgin olive oil. Season with salt and pepper. Now, the part I’m sure you’ve all been waiting for is the GIVEAWAY. The kind folks over at The Turnip Truck have offered to give one of you a $50 gift card to shop there! That’s like a week’s worth of groceries! Or a weekend full of great steak! Doing the following will get you additional entries and more chances to win! 1. Follow me on twitter and tweet “I just entered to win a $50 giftcard to @TurnipTruckWest courtesy of @viveksurti! Enter here: http://wp.me/pXbmX-oP&#8221; and leave a comment that you have done so. 2. Like my page on Facebook, and leave a comment about that too! 3. Follow @TurnipTruckWest on twitter and (you get the gist) leave a comment! 4. Like the Turnip Truck Facebook page and spread the word that you did! AFTER you’ve done all that, you’ll have 5 chances in the running to win your Turnip Truck gift card! Lastly, if you’re interested in learning more about the meats they carry, Turnip Truck is going to have some awesome classes in April, with a tour of their meat department so you can learn what grass fed, sustainable, natural, certified organic and all that good labeling stuff means. The dates and details on how to sign up are below! Classes are free but space is limited. To sign up for this class, please email kathryn@theturniptruck.com. ← 2011: My Favorite Bites, Sips, and Adventures! I liked your facebook page, already like turnip truck on Facebook also. I shop occasionaly at the Turnip Truck, live out a little so it is not always convient, but I like it. My Daughter actually shops there a lot. Of course I would buy the great veggies and fruits with my gift card. I really wish we had a Turnip Truck in Franklin! That needs to happen. I love the gang at TT! I live north of town, but stop by whenever I can. I really, really love their soups and could probably eat $50 worth of that alone, but I would also probably buy fruits and veggies … and local chocolate : ) I already like them on FB and now I like you too. I would buy ALL OF THE THINGS. No really. I love the Turnip Truck, but I might have to use it for a couple week’s worth of lunch from the hot bar. Their soups are the best. Followed Turnip Truck on Twitter! Liked Turnip Truck on Facebook! Aaaaaand finally, I liked YOU on Facebook (why didn’t I already? We may never know the answer to that…)! And at last followed TTT on Twitter!!! I am following you on twitter and I tweeted the message. I would want to buy some of the organic veggies. I am following Turnip Truck West. i shop at the one near us all the time, so i know i’d get a ton of use out of the gift card. in fact, i recently found my new favorite gelato there – malted milk ball gelato. sooo good! and i follow TT on twitter! and I like TT on facebook! I would buy cheese and then chow down at the hot bar! I would buy lots of cheese & bread (to enjoy with my wine, of course), their addictive homemade wedding cookies and dinner from the hot bar. Yummy. Twitter followed and tweeted. 🙂 Also, I have not yet been to the Turnip Truck, but the $50 would be an easy introduction! I’d use it on a weekend’s worth of ribeyes for the grill and some fresh veggies for the sides. My wife is a tenderloin fan, but this would convert her to the wonders of well marbled deliciousness. I would use it towards multiple lunches at the hot bar. I rarely buy take out lunch due to hectic work schedule and strict budget, but when I do, I always treat myself to the turnip truck and savor ever bite!